Aunsoft MTS Converter for Mac works fine as a Mac Sony HX5V to Apple TV Converter And the most attractive feature is its provided video format of Apple TV H.264 (*.mp4) for Apple TV. Now share the step-by-step guide to demonstrate how to put Sony HX5V AVCHD files onto Apple TV. Get ready for this conversion, please connect your camcorder to iMac or Macbook and then transfer AVCHD/MTS video recordings to Apple hard drive. Download Aunsoft MTS Converter for Mac, install and run it. Step 1. Load HX5V MTS files into this program. Drag and drop specified video files into this software directly or import video recordings by clicking "Add" button. You are allowed to load batch video files for merging into single on by ticking the checkbox of "Merge into one file". Step 2. Choose H.264 MP4 for Apple TV. Click "Format" bar and choose Apple TV H.264 Video (*.mp4) from Apple TV section for converting Sony HX5V 1080i MTS to MP4 for Apple TV. Step 3. Edit & deinterlace 1080/60i MTS files. Click "Editor" button and you can edit your loaded MTS files by cropping, trimming, adding image/video and replacing audio. When you click "Effect" tab, you will find the checkbox of "Deinterlacing" lying there. Tick the box, you will get perfect converted video without interlacing effect. Step 4. 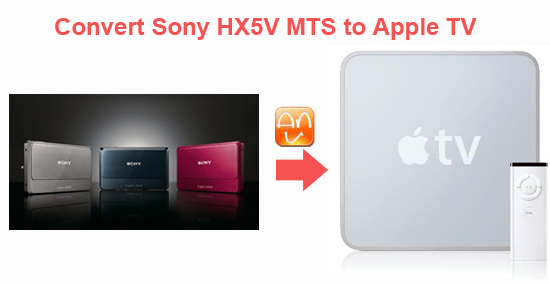 Start this conversion from MTS to Apple TV. Click "Convert" button under the preview window, and this Sony HX5V AVCHD/MTS Converter will start this conversion immediately. If you are a Sony camcorder owner, like Sony HDC-CX350, XR-520V, Alpha NEX-5, HDR-SR10E, Cyber-shot DSC-TX7, you can get more useful information by clciking Aunsoft Sony Column.